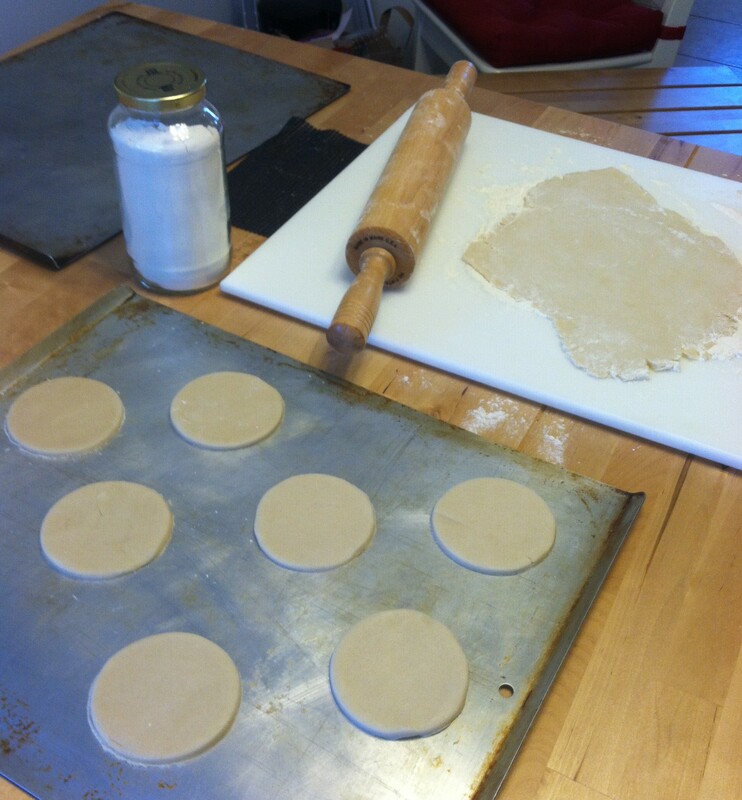 Normally I make my own sugar cookies, but this week has been super busy so I went the easy route and used store bought dough. 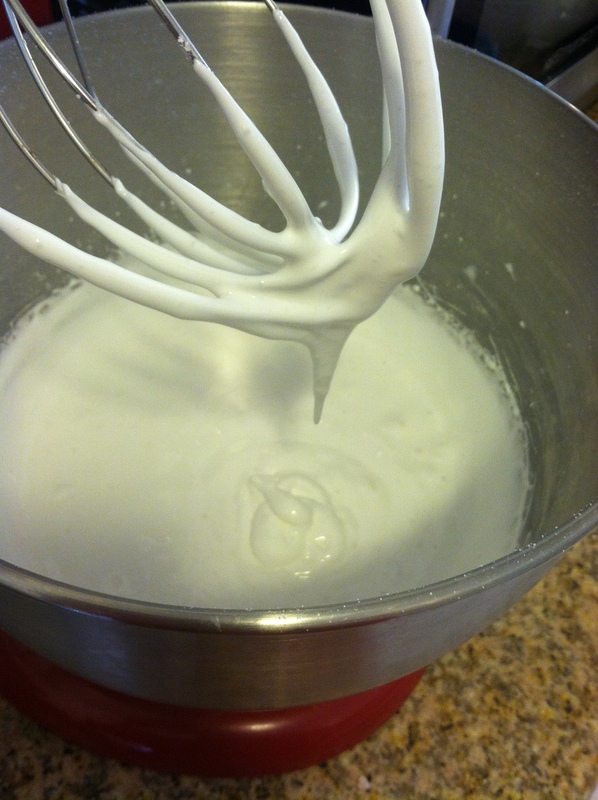 After baking the cookies per the directions and letting them cool, it was time to start making the royal icing. In a microwave safe bowl, combine egg white with 1/3 cup sugar. Heat in microwave for 30-60 seconds until mixture reaches 160 degrees (be careful not to cook too long otherwise the egg will actually cook). 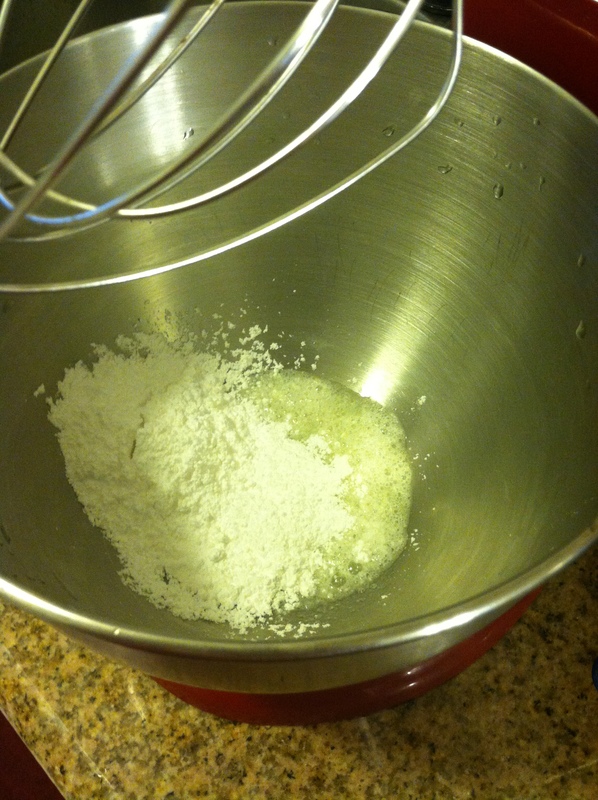 Then, in a large bowl add the egg mixture to the rest of the sugar and beat until stiff peaks form and icing is cool. 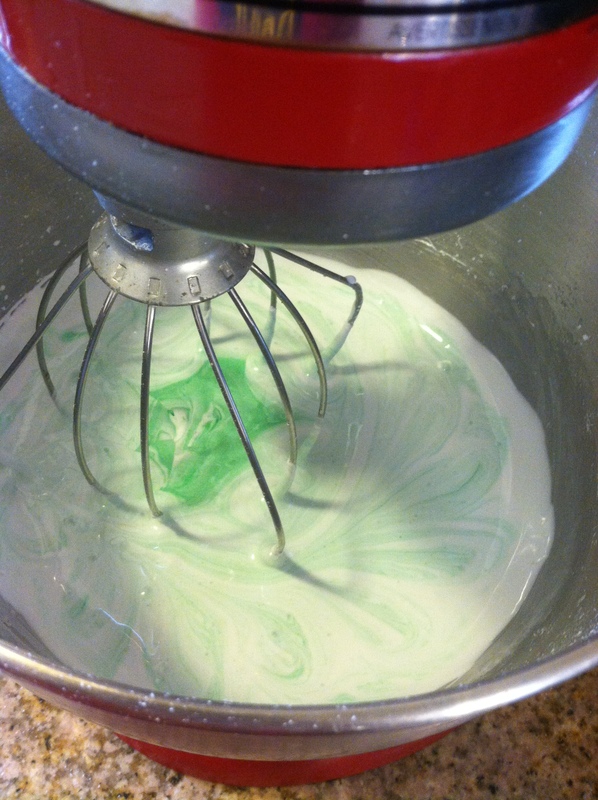 I have a glorious red Kitchen Aid, but you can use any electric beaters, or a whisk if you are the Hulk. Now it’s time to color! 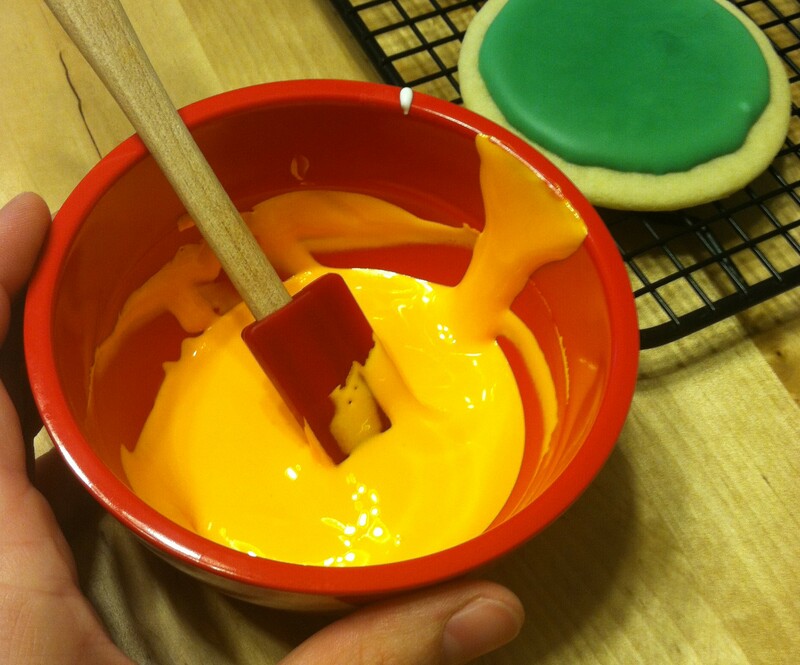 Since I make this recipe a lot, I have a lot of different icing colors. 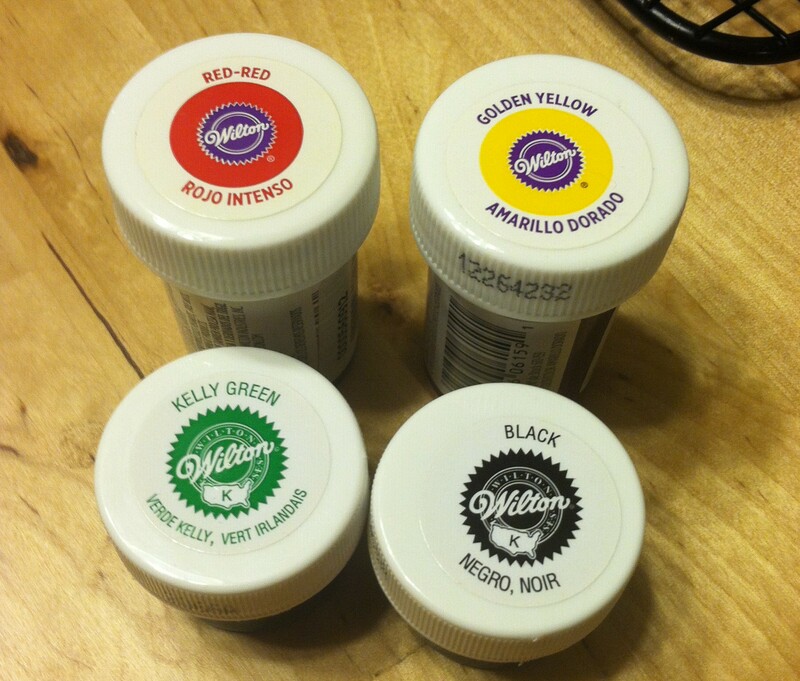 I like to use Wilton Icing Colors which are in gel form and give you an amazing color. The best part is, since they are gel, you have full control over the deepness of the color. For this recipe I used Red-Red, Kelly Green, Golden Yellow and a teeny bit of Black to get the darker version of green that I needed. I poured the icing into a plastic baggie (normally I use pastry bags, but like I said BUSY WEEK) and cut a small hole in the corner to simulate a piping tip. 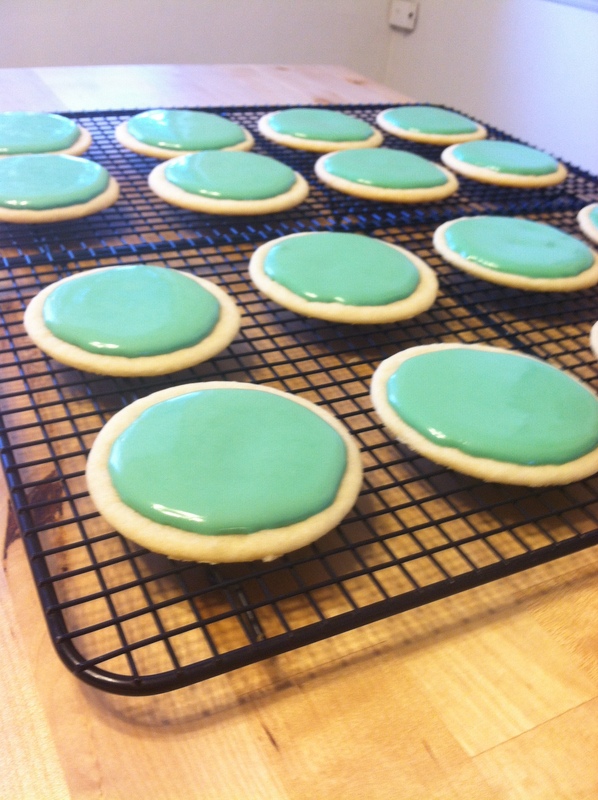 After icing all of the cookies with my green icing, I let them dry for a couple of hours so that my next layer wouldn’t run into the green. 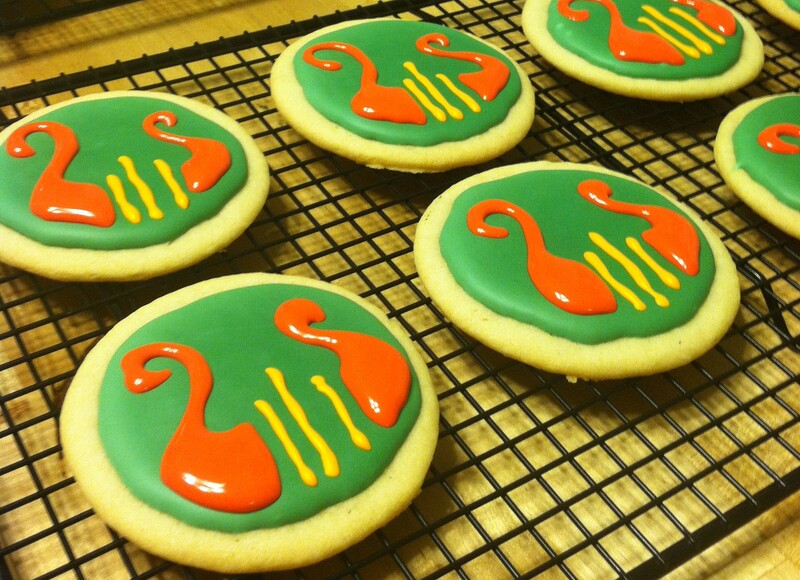 With royal icing, it’s always better to err on the side of waiting if you’re doing multiple layers. 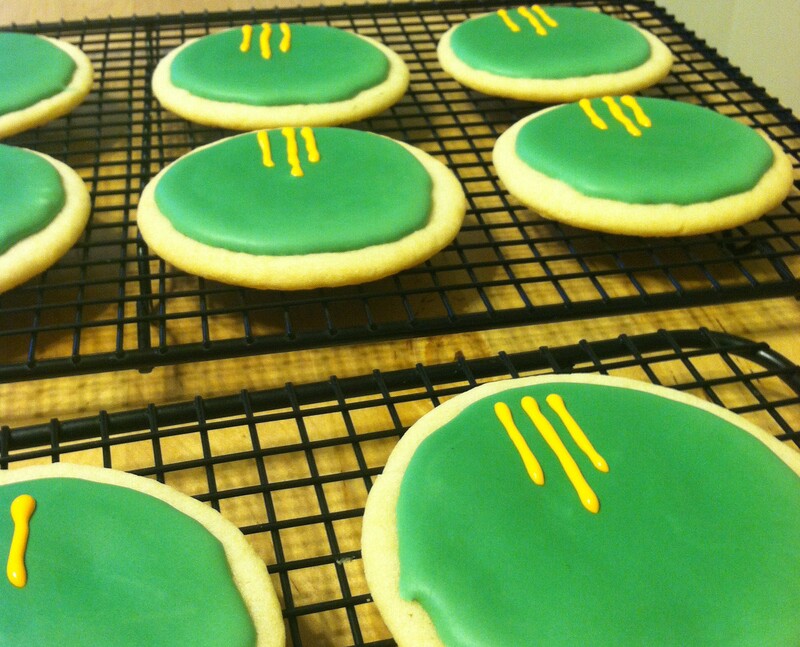 You’ll also want to let your cookies finish drying before putting them away so that the icing doesn’t stick them together. 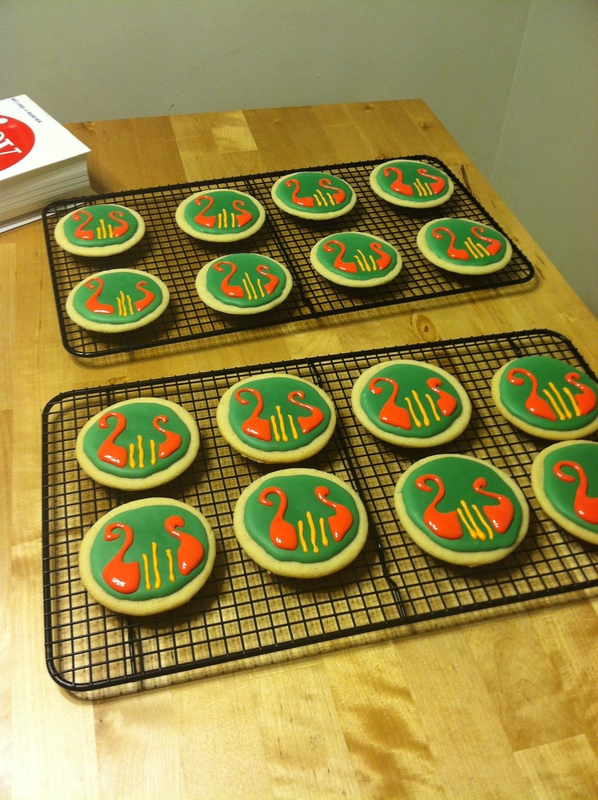 Once the green layer was dry, I repeated the recipe to make the gold and red colors. 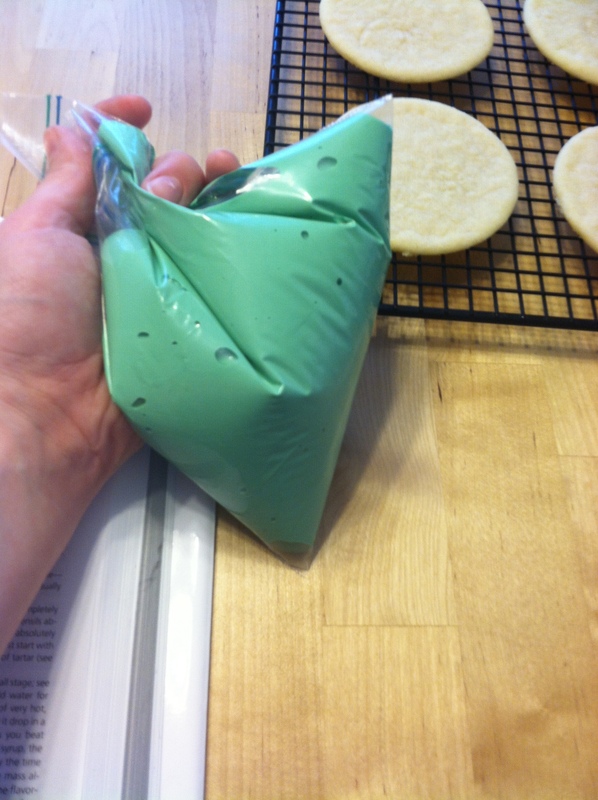 I only needed a little bit of those colors, so I made one recipe, split it in half and reserved the rest in an airtight container with a layer of wax paper covering the icing. 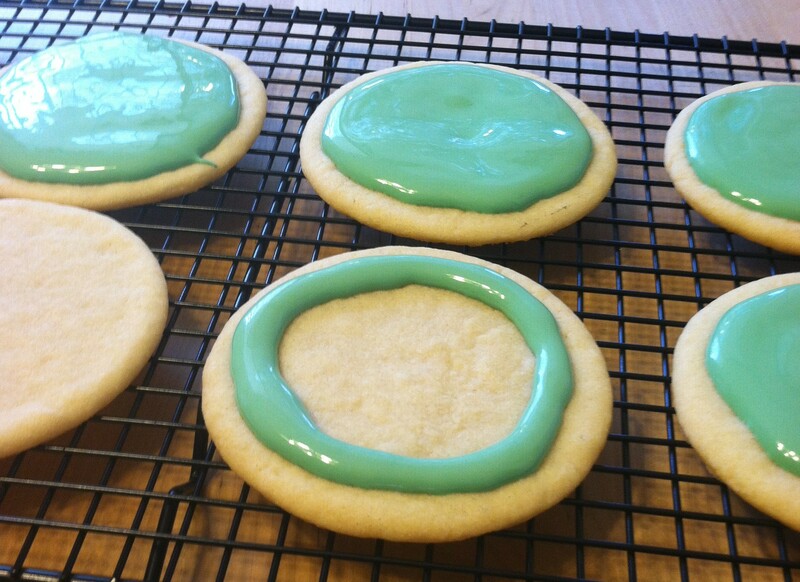 You can store the icing like this for up to 3 days if you have extra. 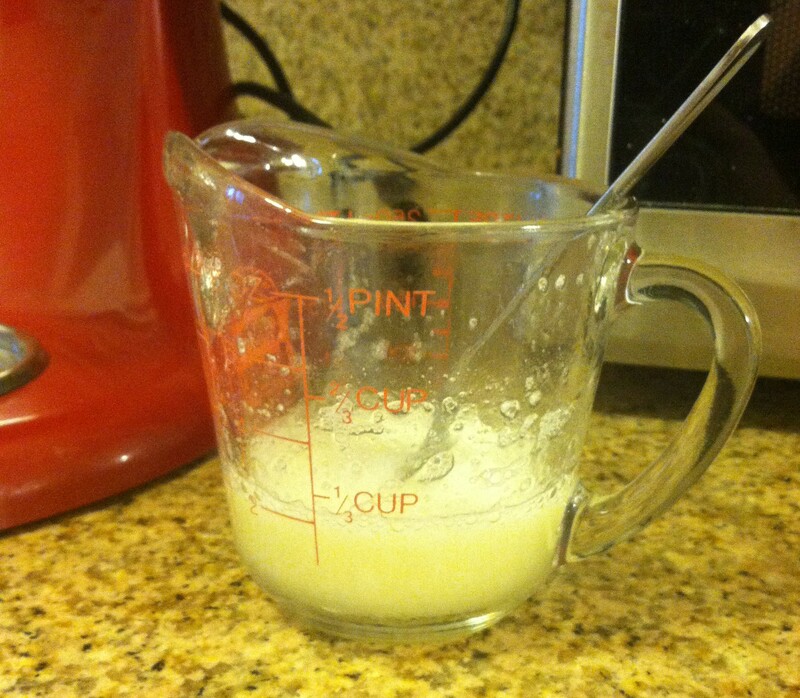 In a microwave safe bowl, combine egg white with 1/3 cup sugar. 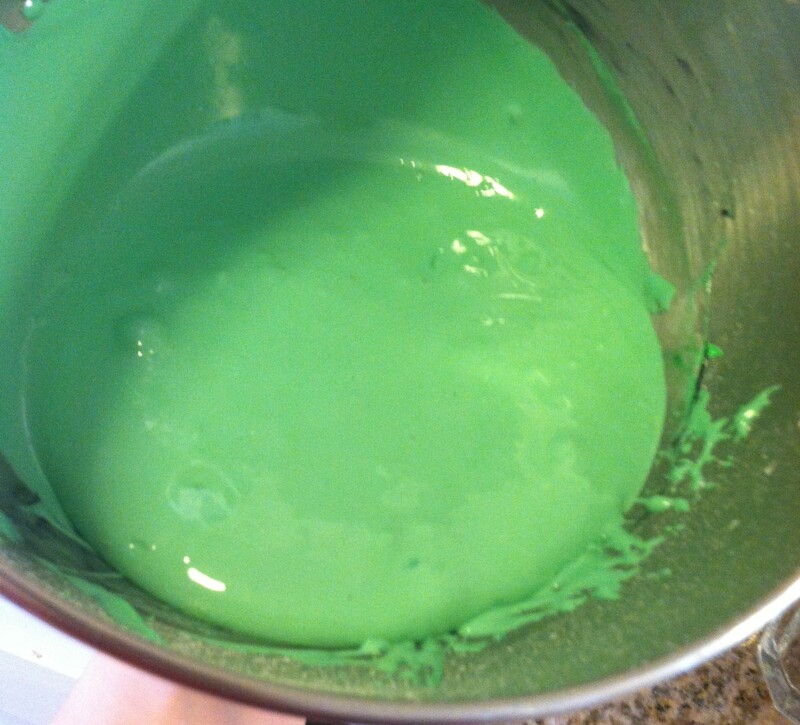 Mix in desired amount of color until completely blended and then ice away!